Amazon has the Pokemon TCG Lycanroc-GX Box Card Game on sale for just $12.98 (regularly $29.98). 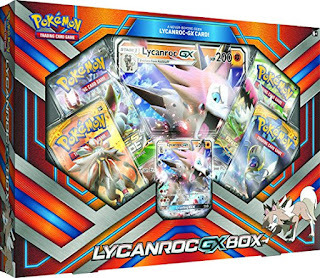 Box includes four Pokemon TCG Booster Packs and an oversized foil card featuring Lycanroc-GX and an online bonus card which contains one code card to continue the action and play online. Lycanroc-GX is ready for a fight. With the once-per-game Lycanfang-GX attack, this Pokémon-GX can help propel your deck to victory—and crush your foe's hopes. This box brings you Lycanroc-GX as both a stunning oversize Pokémon-GX and a foil promo card, because its power is hard to contain on just one card. Call the Midday Form of Lycanroc-GX to your side today. Does not include Rockruff (evolves into Lycanroc GX, necessary to play Lycanroc GX). Great box for avid Pokemon fans. Got a GX Gumshoos from one of the Sun Moon boosters.